How can we utilize carbon dioxide to solve the looming climate change problem caused by anthropogenic greenhouse gas emissions? 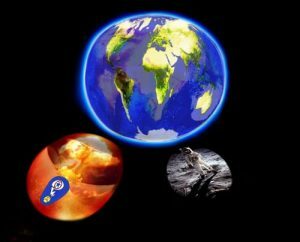 This composite image, courtesy of Todd Siler and Geoffrey Ozin (www.artnanoinnovations.com), visually implies that from two past unprecedented large-scale collaborations, a contrast of two destructive and constructive events, a new and benevolent enterprise, “a global CO2 utilization strategy”, can leverage the collective knowledge and wisdom gained from these earlier works to change the world in an entirely compassionate and environmentally responsible way. The “visual weights” of these images emphasizes the Earth and everything we’re doing now to preserve it while acknowledging the ever present reality of nuclear war, which is symbolic of all kinds of “disruptive” technologies we choose to create for defensive reasons. Also, implicit in the images is the visceral feeling that if our world leaders do not choose wisely now, we can end up inadvertently and irreversibly upsetting our planet. Solving the looming climate change problem caused by anthropogenic greenhouse gas emissions differs from other unprecedented, large-scale collaborations that have changed our world dramatically. It sharply differs because it’s a global challenge driven by compassionate intentions and understanding expressed by many nations that now recognize the science substantiating the foreseeable peril. Failure to find an answer in a timely manner could have serious consequences for the whole world. The photomontage below depicts contrasting examples of urgent yet seemingly impossible problems and challenges that brought together groups of the brightest scientists and engineers working towards a common goal. The most prominent 20th century examples include the Manhattan Project and NASA’s Apollo 11 lunar landing. These projects, different in scale and scope, are unmistakably distinguished by the common associations invoked by man’s most destructive and constructive potential. They express our deep conviction: anything is possible when we’re willing and able to work collaboratively in solving major problems and meeting our most pressing challenges by focusing our full attention on them. The climate change problem is however, very different from the other two problems. The first two had a definite end and they agreed what they wanted to achieve. There is scientific agreement that net global anthropogenic emissions need to be reduced to zero, although disagreement on the schedule due to different views on the temperature increase target (1.5 or 2 oC) and the probability of achieving the target (66%, 50% or less). The Global CO2 Utilization Project is a new and benevolent endeavor with a message of hope and higher awareness. It is founded on the premise that CO2 emissions can be employed as a feedstock for the synthesis of chemicals and production of fuels. The capture, storage and utilization of CO2 emissions for chemical synthesis achieve three desirable goals: i) less CO2 is emitted into the atmosphere, ii) a safe supply of chemicals is provided, and iii) the demand for secure energy is satisfied. This paradigm makes CO2 capture, storage and utilization potentially a “partial solution”, treating it as a commodity chemical to be used as a valuable reserve instead of a waste, an asset rather than a liability. Resolving the problem will necessitate a global alliance of universities, industries and governments working together to find the best solution for a common and generous cause that can leverage the collective knowledge and wisdom gained from these earlier collaborations. 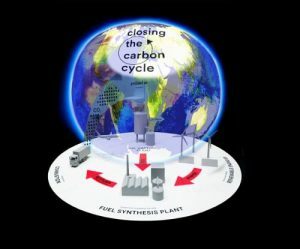 This photomontage unites the vision of a global CO2 utilization strategy with a fuel synthesis plant that ena-bles closing the carbon cycle. Images courtesy of Todd Siler and Geoffrey Ozin (www.artnanoinnovations.com) and Matthias Gommel and Peter Weibel, “GLOBALE: Exo-Evolution” exhibition at the ZKM Center for Art and Media in Karlsruhe, Germany, 31.10.2015 to 28.02.2016. The climate change problem is on much too large a scale to be solved by a single country. For the first time in the history of humankind we are faced with the existential challenge of having to reduce CO2 emissions produced by our fossil based resources, an inconvenient necessity considering they have miraculously created and energized our global economy since the industrial revolution. But paradoxically, fossil fuels that empower our globalized society now threaten its future. Fortunately, a partial solution does exist. It is founded upon the vision of a global CO2 utilization strategy. We already have the technology in place to realize this vision. There are currently many emerging companies and established industries around the world that use CO2 from different sources to produce megatons of chemicals, materials and fuels. These industrial processes and products are changing our way of thinking about CO2, not as a waste product to fear, nor as a costly liability but instead as a valuable asset. All we need to do is put the policies and institutions, and public and private investment in place to increase production of these commodities by CO2 utilization at industrial facilities around the world. A key question however, is how much capacity and market demand is there for CO2 utilization products? Estimates from different sources of current market demands for products seem to favor around 5% conversion of global CO2 emissions into synthetic chemicals and about 10% into synthetic fuels. With continued research and development it is expected that the market potential for manufactured CO2 built products will grow. For illustrative purposes, in a scenario where 100% urea, 30% minerals, 20% chemicals and polymers, 10% methanol, and 5% diesel and aviation fuels are made from CO2, this would be equivalent to 83% of the IPCC 2030 global emission reduction target (Armstrong, K. & Styring, P., Frontiers in Energy Research. 3, 8, 2015; Lim, X., Nature 526, 628, 2015; Scott, A., Chemical and Engineering News, 93, 10, 2015). While carbon capture and utilization today may not be a complete solution it is complementary to carbon capture and storage and together they can play an important role in helping to close the carbon cycle. The consensus in these reports is that CO2 utilization can be commercially viable with short turnaround times for profits on investment. Even with a tax on carbon and government subsidies, this seems like a small price to pay to help commodities made from recycled CO2 establish a firm footing in the global economy to ensure that they stay competitive with those made from finite fossil resources. This new and benevolent collaborative endeavor can change the world, but only with a world of global citizens cooperating and committed to change. Science-technology-industry-government working in a concerted manner are “not” enough. People must champion and sustain these efforts to make it work. We know what we need to do, we know how fast we need to do it, and we know the energy and economic balances to enable a carbon neutral sustainable world. The question is do we have the will to work together and do it in a timely manner before an irreversible and deleterious climate event occurs and changes our way of life?